c.10,500BP The Mesolithic period begins as the last ice sheet over Britain starts melting and the climate becomes warmer. c.8,500BP Britain becomes an island. c.4000BC Pottery appears in Britain for the first time. The Neolithic period begins. 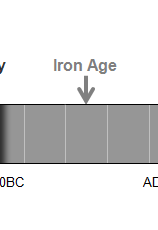 c.2500BC The Bronze Age begins. c.1600BC The building of Stonehenge is completed. c.2200BC Bronze making becomes popular. c.1200BC Field systems start appearing.